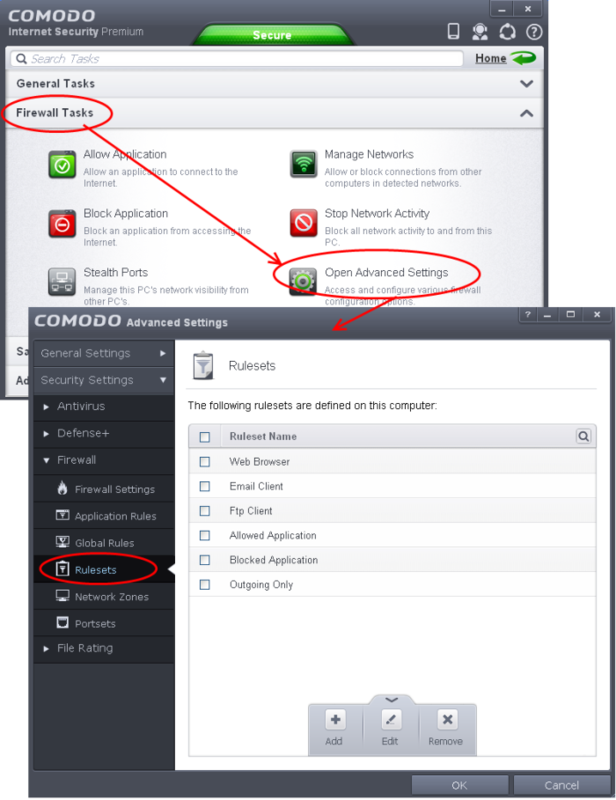 This page outlines the functions of Comodo's Firewal and helps you to set up a secure connection to the Internet. 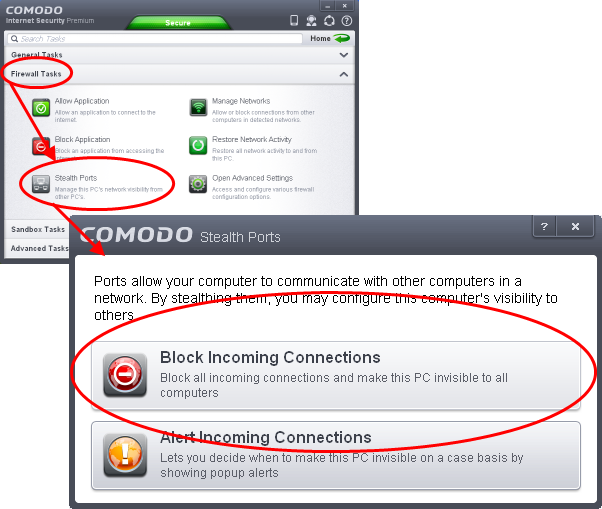 Port Stealthing is a security feature whereby ports on an Internet connected PC are hidden from sight, sending no response to opportunistic port scans. 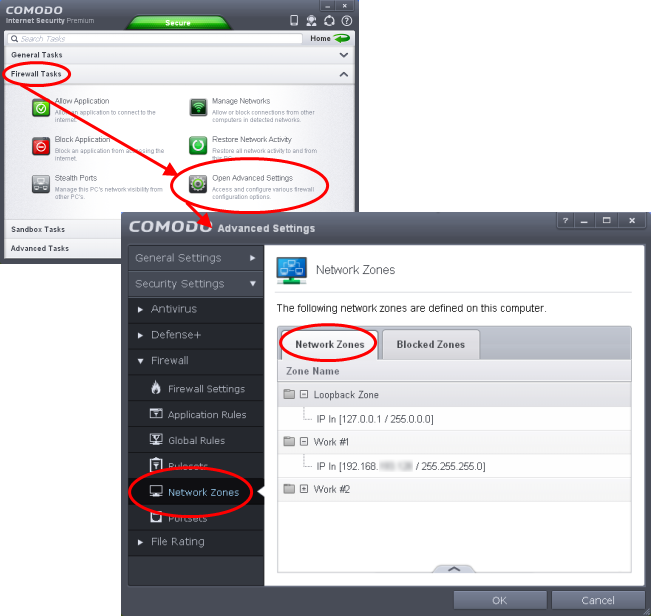 The 'Network Zones' settings allow you to configure the protection level for network connection to a Router/home network. (This is usually done automatically for you). In most cases, the IP address of the auto detected Network zone should be 192.168.1.100/255.255.255.0 . Check these addressees and click 'OK'. 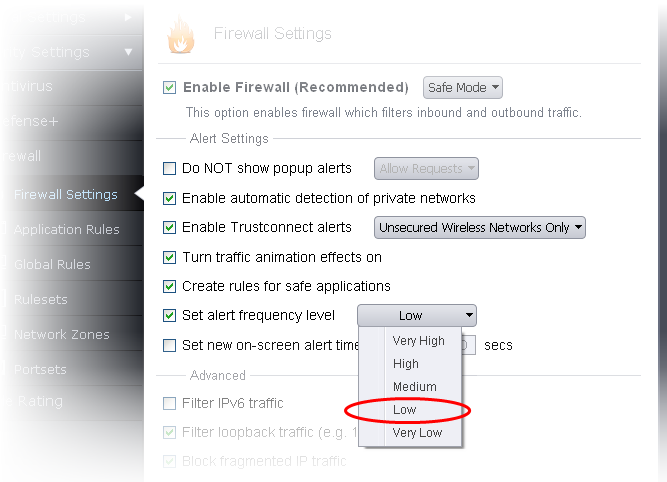 The Firewall Behavior Settings option allows you to configure the protection level for your Internet connection and the frequency of alerts generated. 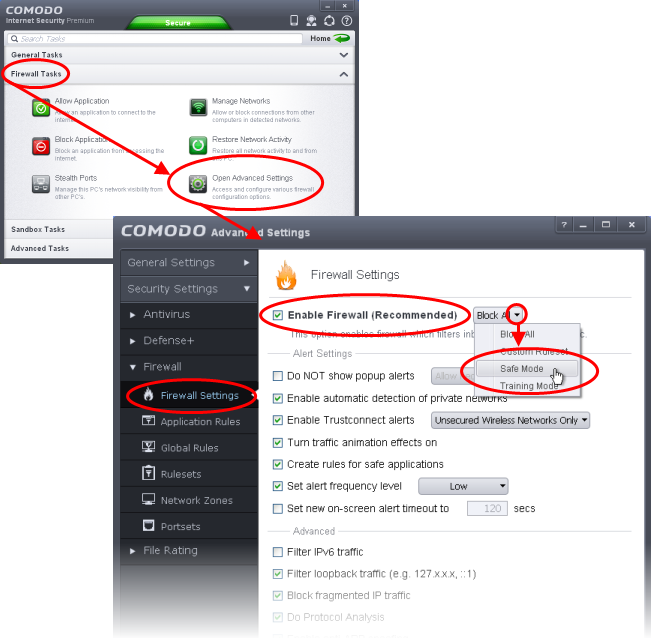 Ensure that 'Enable Firewall' is selected and choose Safe mode from the drop-down beside it. Select 'Set alert frequency level' option and choose 'Low' from the drop-down. 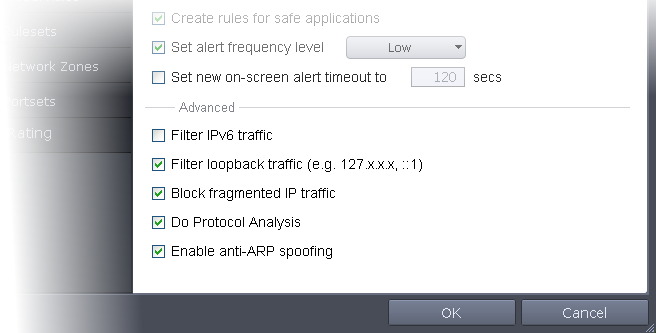 At the 'Low' setting, the firewall shows alerts for outgoing and incoming connection requests for an application. 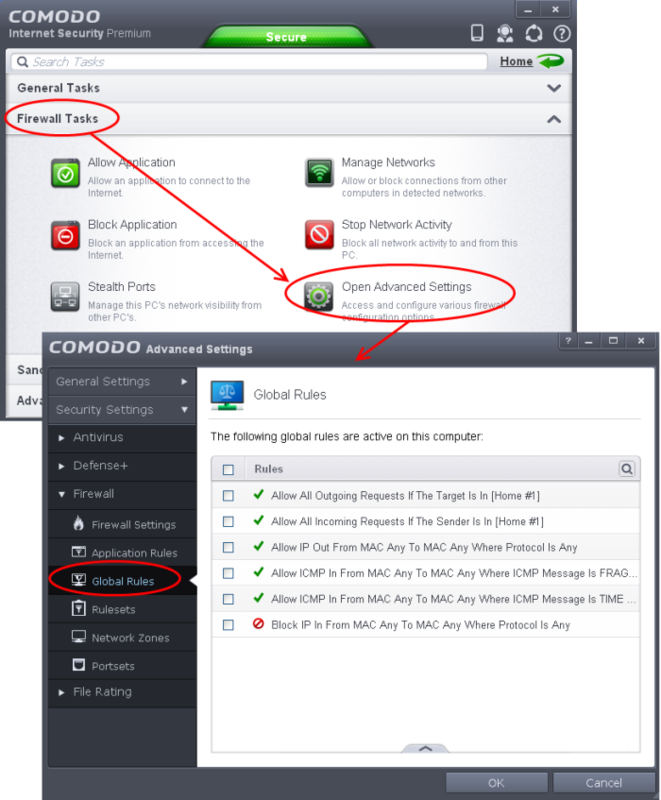 This is the setting recommended by Comodo and is suitable for the majority of users. Block fragmented IP traffic - When a connection is opened between two computers, they must agree on a Maximum Transmission Unit (MTU). IP Datagram fragmentation occurs when data passes through a router with an MTU less than the MTU you are using i.e when a datagram is larger than the MTU of the network over which it must be sent, it is divided into smaller 'fragments' which are each sent separately. Fragmented IP packets can create threats similar to a DOS attack. Moreover, these fragmentations can double the amount of time it takes to send a single packet and slow down your download time. 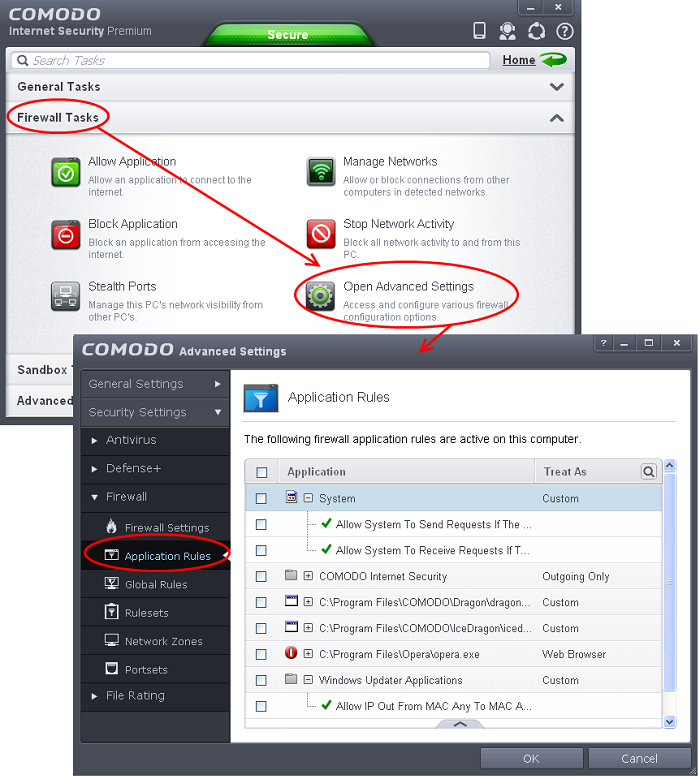 You can configure and deploy traffic filtering rules and policies on an application specific and global basis and predefined firewall rulesets. Click the handle from the bottom and Add or Edit rules for specific applications manually or remove them. Click the handle from the bottom and Add or Edit global rules manually or remove them. Click the handle from the bottom to and Add, Edit or remove rulesets. You need not make your own rulesets, the defaults are usually enough.